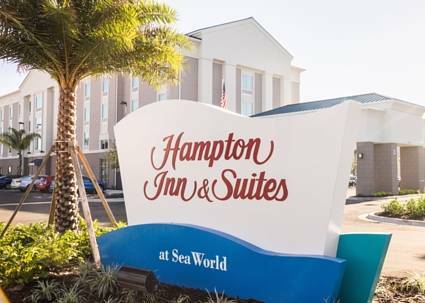 Our Hampton Inn - Suites Orlando at SeaWorld hotel offers a comfortable place to stay in Orlando Florida*s entertainment district. Have fun at this modern hotel that has an aquatic decor great service and a friendly staff. Ride the free shuttle to SeaWorld and Universal Studios and purchase tickets for Orlando theme parks at the front desk. Whether you*re here for an intimate romantic getaway a business trip or a family vacation stay in a room offering clean and fresh Hampton beds and free WiFi. Heat up meals in the microwave and store cold drinks and snacks in the refrigerator. Watch your favorite programs on the flat-screen TV or catch up with work using the work space or handy lap desk. Join other guests in the lobby each morning for a free hot breakfast including fresh waffles hot and cold items fresh juice and coffee. If you*re in a hurry grab a Hampton*s On the Run Breakfast Bag Monday through Friday on your way out. Pick up a snack at our convenience store. Ask our friendly staff for dining options near our Orlando FL hotel. The outdoor pool offers an opportunity to relax and refresh and the fitness center has modern equipment. Hold a meeting in our 560 sq. ft. function space and print out a report in the business center. Friendly service clean rooms comfortable surroundings every time. If you*re not satisfied we don*t expect you to pay. That*s our commitment and your guarantee. That*s 100 Hampton. Casual chain restaurant with a festive vibe serving beer cocktails - a wide menu of American fare. Lively sports-bar chain dishing up wings - other American pub grub amid lots of large-screen TVs. Counter-serve bakery/cafe chain serving sandwiches salads - more known for its bread - free WiFi. This fine dining restaurant specializes in dry aged steaks chops fresh seafood and wine selections from all over the world. A healthy grill and wine bar invites you to discover the flavor of our seasonally changing menu. Discover Yard House to enjoy over 100 ales craft beers IPA beers lagers and imported beers on tap plus an extensive menu of made-from-scratch dishes.